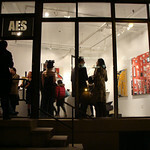 AES Gallery is dedicated to the promotion and showcasing of visual artists working in traditional media in our ground floor gallery space. Participation may include solo / group shows depending on the business season. Artists may contact the gallery director by email or by arranging an appointment for a portfolio review.